The Federal Railroad Administration has started to take applications from local governments, states and railroads for $25 million in grants to fund their railroad safety efforts. Applicants can ask for funds for safety upgrades to railroad crossings, tracks, tunnels, yards, bridges, etc. The grants have been made available under the 2016 Consolidated Appropriations Act. According to US Transportation Secretary Anthony Foxx, as the population of the US grows, rail is playing a bigger role in moving people and freight around the US. 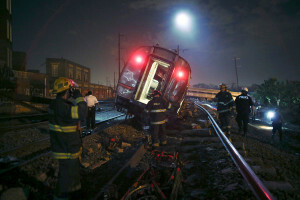 “To do that safely, we must invest in our rail infrastructure,” he said last week. FRA stated that it would accept railroad safety funding applications until June 14. Our railroad accident attorneys are pleased that FRA is making these funds available to upgrade railroad safety in America. Our railroad accident lawyers have represented many clients who have suffered serious injuries, or their loved ones have even died, in various types of railroad accidents. Whenever we see the federal government improving railroad crossings it certainly is a positive, especially for railroad crossing safety. However, when a railroad that owns the tracks that run over those highway crossings is sued because of injury or death, that’s the moment that the railroad claims that they have very little or no responsibility whatsoever. What most consumers may find surprising is that the railroads often receive money from state or federal government for lights or gates at crossings and do everything they can to avoid paying for them. Even in the face of prior injuries or deaths at the crossing, the railroads who operate on the tracks argue that it should not be their responsibility to pay for gates or lights because the public has built a highway across their Railroad right-of-way. Their position, often overlooked by the public, is that it is local, state or federal government that should improve the safety of motorists traveling across the railroad crossing. This type of multiple party responsibility is exactly what makes civil injury or death litigation at railroad crossings complex. Indeed, most states have variable or different jury instructions in these types of cases that dictate the railroad’s responsibility at a railroad crossing collision. Many people do not know that the railroad company that uses that crossing is responsible for maintaining the safety of the crossing. The safety gates must work and flashing lights must be operational, and all vegetation and grass needs to be regularly cut away from the tracks to not obscure driver vision. A good railroad accident attorney with experience in the state in which the accident occurred can be invaluable in recovering damages in a lawsuit. 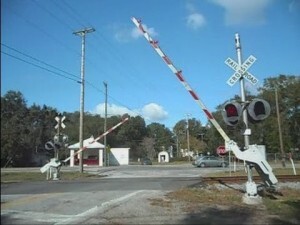 For example, our railroad accident lawyers bring in retired railroad workers to investigate railroad crossing accidents. Using their expert testimony, we have been able to prove in some cases that appropriate precautions were not taken at some railroad crossings. In 2011, train engineer Darrell May was operating his train according to the rules in Texas and as he rounded a curve at 50 MPH, he saw a stalled tractor trailer on the tracks in front of him. He pulled the emergency brakes immediately, and he and his colleague threw themselves on the floor of the cab. The collision with the tractor trailer at the railroad crossing was so severe that May was knocked out and he awoke days later in a hospital bed. Since that day, the former train engineer’s life has been changed forever. He had head trauma that caused a brain bleed, which makes his right arm tremor constantly. He also suffered nerve damage in his mouth so that eating anything cold causes severe tooth pain. The railroad crossing crash also blew out his back and his lower back has been fused with two rods, four screws and six pins. The back injury also caused nerve damage so that his left foot constantly tingles as if it is asleep. May recently warned Texas drivers at a press conference to never attempt to beat the train at a railroad crossing or to stop over the tracks under any conditions. He also noted that from the driver’s perspective at a railroad crossing, it is difficult to judge distance, so the train could be a lot closer than you think. It also is hard to tell how fast the train is traveling when looking at it straight on from the tracks. May also recommended that every railroad crossing post should have a national 800 number and a six digit code. If a driver sees a vehicle stalled on the tracks, they should be able to call that number to alert train operators of the problem. Our railroad accident lawyers in Virginia have represented far too many people who have been injured at railroad crossings. In some cases, the railroad or the train operator is at fault, but in the case above, the tractor trailer operator was at fault and his actions led to devastating injuries for the innocent victim. We once handled a case where a railroad worker was injured at a crossing caused by a negligent truck driver, which resulted in a $650,000 verdict. We wish that truck drivers would ensure that such tragic accidents never occur. Even if the truck stalls on the tracks, it is possible that simply properly maintaining the rig could prevent such dangers. The maps app on your smartphone soon could be able to tell you about the location of an upcoming railroad crossing. Audio and visual alerts will soon be coming to many smartphones because of a new partnership between Google and the Federal Railroad Administration (FRA). Finding innovative ways to reduce the death rate at 225,000 railroad crossings in the US is a major priority of the new FRA administrator, Sarah Feinberg. Railroad safety has improved overall in the US, but fatalities and railroad crossing accidents increased in 2014, which was the year before Feinberg took the helm. There were 267 deaths in 2014, up from 232 in 2013. FRA has not determined what caused deaths to increase so dramatically that year. They think it could be that there were just more drivers on the roads and more trains on the tracks. But some experts think that technology is not doing a good enough job to prevent railroad crossing deaths, and they hope that the new Google/FRA partnership will help. FRA currently requires each state to do monthly inspections of 5000 railroad crossings that have the crossing interconnected with a traffic signal. When it is working right, the signals can usually prevent cars and trains from being on the tracks at the same time. But if the signals are not working right, bad things can happen. As this new partnership gets under way, the FRA hopes that drivers getting alerts from their smartphone about an upcoming railroad crossing can save lives. Our railroad accident lawyers in Virginia and North Carolina are pleased that the US government is working with Google to leverage technology to prevent needless railroad crossing deaths. Our railroad crossing accident lawyers have represented far too many families of the injured and killed in these mostly preventable tragedies, such as this railroad crossing accident in Prince William County VA that led to a sizable settlement.